Beautiful, as always! My favorite floral: Carnation! These are lovely Silivia! Lavender is one of my best sellers, but I prefer a heady rose fragrance. Oh, and honeysuckle and jasmine too! Beautiful soaps!! I also love honeysuckle & have found a wonderful fragrance oil that barely speeds trace. Lavender is also a good seller. Magnolia also sells well for me in the Spring. I found a hyacinth fragrance oil this past year that keeps it’s scent for a long time. For most of the floral fragrances, I have found that if you warm them slightly before blending, they act better…blending smoother without ricing. Stunning, Silvia! The design, the colors, the pictures! I only wish I could smell it! Love this! Trying to figure out how you did the asymmetry. I wonder what it smells like? The soap is so beautiful! 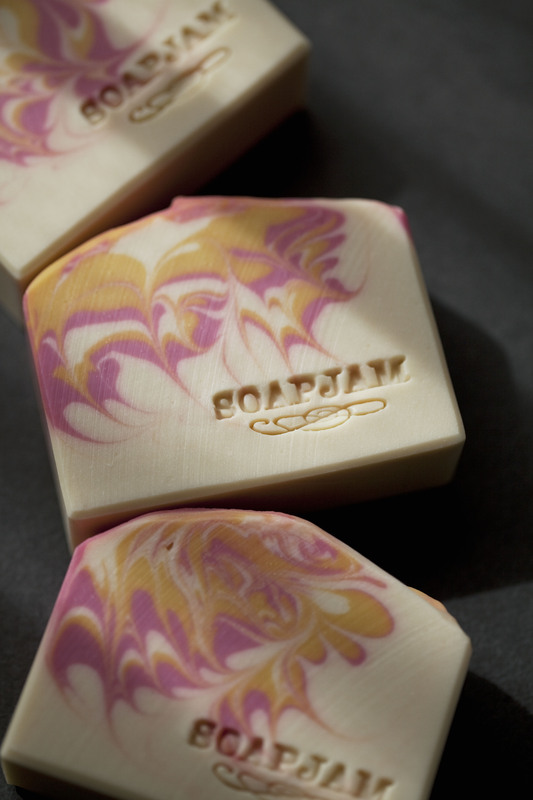 The colors and swirls do look soft and sweet, reminiscent of the smell of honeysuckle. I have never tried any honeysuckle fragrance but if yours are the same or at least close to the real thing, I can easily understand your mother-in-law’s preference. Honey suckle is a great scent. So is jasmine. Your hanger swirl is an absolute winner, the colour combo is so warm and yet zesty! I love it. Lucky M.I.L! I can see why honeysuckle would be your m-i-l’s new favourite, it’s such a sweet, delicious scent. Love the colours you chose, did you do that deliberately to capture the colours of honeysuckle as well? I have yet to find a floral that I’m absolutely in love with, but maybe that’s because I haven’t tried honeysuckle yet. Your m-i-l is very lucky to have such a wonderful d-i-l who’d make her all these gorgeous soaps. hello! your soaps are gorgeous! i love how you get the pattern in the top corner only. how did you do that? do you have video tutorials? I haven’t been making soap for very long and the only floral i’ve made so far is lavender. so far my favorite mix is Rosemary Lavender Peppermint.